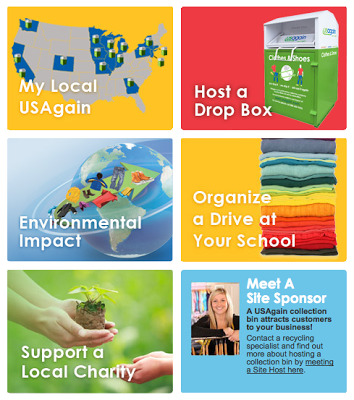 This week I was recently introduced to an eco-friendly organization that really touched a chord with me. When recycled clothing gets a second life that can mean a lot of things and organizations like the for-profit USAgain.com is making it mean green in more than one way. Most clothing collected by USAgain and other textile recyclers is reused in its original form as secondhand clothing, but what about the stuff that is just too worn out to be re-worn? Have you ever wondered where old clothes go to die? Well, the good news is that they are the new millennium sustainable gold and gain life everlasting in recycled products. 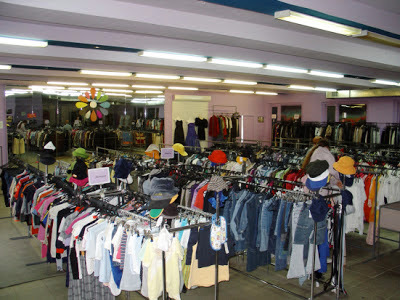 Clothing resale outlets typically don't sell clothes are are too worn out for use, but to recycling companies like USAgain.com, these old clothes are like gold. When you recycle the stained, old t-shirt you used to wear for gardening or working on the car, there is a good chance it will be turned into another useful product that you probably have in your home right now. Companies like Coastal Wipers sell a considerable selection of wiping cloths and shop towels made from various recycled clothing items. Buying recycled towels is a smart alternative to buying new ones, and industries (notably the oil industry, ironically) have been using recycled shop towels for quite a while. There is really no need to use precious cotton, water and other resources to produce cloths that could be made from recycled items. In fact, about 17 gallons of water is used to produce a new shop towel which is 17 more than needed to create a recycled one. Companies with an eco-friendly mission like FactoryDirectPromos.com create recycled bags from plastic water bottles as well as post consumer waste like cotton. Reusable bags are so much more than a way to just carry your groceries. They are a way to make good use of textile recycling and other post consumer waste. This gives clothing a new life and our planet a chance at sustainability. Many recycled textiles are made into wiping rags and other cleaning products, but contrary to what you might think, textiles are recycled into products for other uses. Jinja, a Portuguese company that sells products made from recycled textiles, offers some of the most aesthetically appealing items made from recycled textiles. A few of their recycled items include a Jackson Pollock-inspired placemat and wine bottle coolers which prove that textiles can be recycled into more than cloths and rags, they can be made into interior design pieces with a bit of flair. Have a ripped-up pair of jeans lying around? By recycling them, your jeans may very well be broken down and turned into insulation. Cotton Blue To Green, a non-profit insulation manufacturer, gives recycled denim a new life by turning it into UltraTouch insulation, manufactured by Bonded Logic. This denim insulation is safe to use and works exactly like normal insulation, and of course, no new resources are needed to create it, just old, unwearable jeans. According to EPA data, all textiles can be recycled or reused yet only 15% are, while the remaining 85% is trashed. These mistakenly trashed items often include the ripped, stained and damaged items no longer fit for wear. While it may be fair to say a ripped article of clothing is no longer fit for reuse, it's not true that it is useless as it is a perfect fit to be recycled into a new, useful product. And I haven't even mentioned the economic gains made possible by the recycling of textiles. Recycling clothing creates ten times more jobs than waste removal and landfilling, while reuse creates approximately 75 times more jobs. Recycling textiles creates jobs, conserves resources and keeps harmful waste from entering landfills. Truly a win win for us all. The next time you find yourself with an unwearable t-shirt, don't toss it in the trash, find a USAgain or other textile recycler and give it a new, green life.